Maximum 'M1' Series 5 - 10 tons air-cooled portable liquid chillers can be supplied with the centrifugal blower options, as shown. The increased CFM allows the chiller to operate at lower head pressures in high ambient temperature conditiions. The damper regulates the operating head pressure in low ambient temperature conditions. 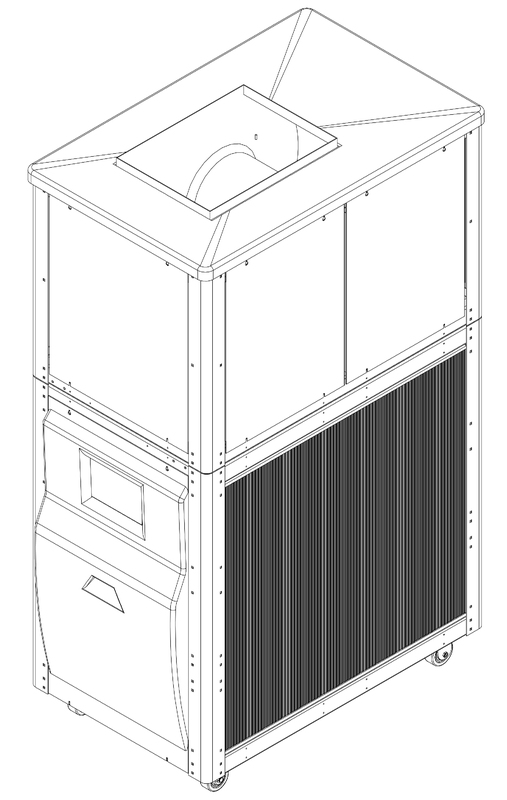 The blower assembly has flange mountings that accept exhaust air duct work for supplemental winter heating and summer ventilation. Pillow block bearings with grease fittings provieds longer service life and effort free maintenance. Specifications. Use the to open the sections below. Tons capacity at 12,000 BTU/ton per hour @ 50°F LWT @ " 115°F condensing temperature. Capacities may be +/- 5% as reserved by the compressor manufacturer. Operating at temperatures below 50° will reduce chiller capacity. The minimum recommended operating temperature when no glycol is used is 48°F. Static pressure in inches of water. Design ambient conditions. Loss of capacity and/or difficulty operating will occur at higher ambients. Minimum recommended ambient is 60°F. Full load amps are higher than run load amps and must be used for sizing disconnects and supply wiring. Approximate unit weight crated for shipment. For more information about the blower option on portable liquid chillers call the Advantage Sales Department at 317-887-0729. Would you like to Download FYI #211 to your browser?